Two APL container ships pass each other. Container ships avoid the complex stevedoring of break-bulk shipping. There are two main types of dry cargo: bulk cargo and break bulk cargo. Bulk cargoes, like grain or coal, are transported unpackaged in the hull of the ship, generally in large volume. Break-bulk cargoes, on the other hand, are transported in packages, and are generally manufactured goods. Before the advent of containerization in the 1950s, break-bulk items were loaded, lashed, unlashed and unloaded from the ship one piece at a time. However, by grouping cargo into containers, 1,000 to 3,000 cubic feet (28 to 85 m3) of cargo, or up to about 64,000 pounds (29,000 kg), is moved at once and each container is secured to the ship once in a standardized way. Containerization has increased the efficiency of moving traditional break-bulk cargoes significantly, reducing shipping time by 84% and costs by 35%. In 2001, more than 90% of world trade in non-bulk goods was transported in ISO containers. In 2009, almost one quarter of the world's dry cargo was shipped by container, an estimated 125 million TEU or 1.19 billion tonnes worth of cargo. The first ships designed to carrying standardized load units were used in the late 18th century in England. In 1766 James Brindley designed the box boat "Starvationer" with 10 wooden containers, to transport coal from Worsley Delph to Manchester by Bridgewater Canal. Before the Second World War first container ships were used to carrying baggages of the luxury passenger train from London to Paris, Golden Arrow / Flèche d'Or, in 1926 by Southern Railway. These containers were loaded in London or Paris and carried to ports, Dover or Calais, on flat cars in the UK and "CIWL Pullman Golden Arrow Fourgon of CIWL" in France. The earliest container ships after the Second World War were converted oil tankers, built up from surplus T2 tankers after World War II. In 1951, the first purpose-built container vessels began operating in Denmark, and between Seattle and Alaska. The first commercially successful container ship was Ideal X, a T2 tanker, owned by Malcom McLean, which carried 58 metal containers between Newark, New Jersey and Houston, Texas, on its first voyage. In 1955, McLean built his company, McLean Trucking into one of United States' biggest freighter fleets. In 1955, he purchased the small Pan Atlantic Steamship Company from Waterman Steamship and adapted its ships to carry cargo in large uniform metal containers. On April 26, 1956, the first of these rebuilt container vessels, Ideal X, left the Port Newark in New Jersey and a new revolution in modern shipping resulted. MV Kooringa was the world's first fully cellular purpose-built container ship and was built by Australian company, Associated Steamships Pty. Ltd. in partnership with McIlwraith, McEacharn & Co and commissioned in May 1964. Container vessels eliminate the individual hatches, holds and dividers of the traditional general cargo vessels. The hull of a typical container ship is a huge warehouse divided into cells by vertical guide rails. These cells are designed to hold cargo in pre-packed units – containers. Shipping containers are usually made of steel, but other materials like aluminum, fiberglass or plywood are also used. They are designed to be entirely transferred to and from smaller coastal carriers, trains, trucks or semi-trailers (and so are carried by different modes of transport during one voyage, thus giving the name intermodal transport). There are several types of containers and they are categorized according to their size and functions. Today, about 90% of non-bulk cargo worldwide is transported by container, and modern container ships can carry over 21,000 TEU. As a class, container ships now rival crude oil tankers and bulk carriers as the largest commercial vessels on the ocean. Although containerization caused a revolution in the world of shipping, its introduction did not have an easy passage. Ports, railway (railroad in the US) companies, and shippers were concerned about the huge costs of developing the ports and railway infrastructure needed to handle container ships, and for the movement of containers on land by rail and road. Trade unions were concerned about massive job loss among port and dock workers at ports, as containers were sure to eliminate several manual jobs of cargo handling at ports. It took ten years of legal battles before container ships would be pressed into international service. In 1966, a container liner service from the US to the Dutch city of Rotterdam commenced. Containerization changed not only the face of shipping, but it also revolutionized world trade as well. A container ship can be loaded and unloaded in a few hours compared to days in a traditional cargo vessel. This, besides cutting labor costs, has reduced shipping times between ports to a great extent; for example, it takes a few weeks instead of months for a consignment to be delivered from India to Europe and vice versa. It has also resulted in less breakage due to less handling; also, there is less danger of cargo shifting during a voyage. As containers are sealed and only opened at the destination, pilferage and theft levels have been greatly reduced. Containerization has lowered shipping expense and decreased shipping time, and this has in turn helped the growth of international trade. Cargo that once arrived in cartons, crates, bales, barrels or bags now comes in factory sealed containers, with no indication to the human eye of their contents, except for a product code that machines can scan and computers trace. This system of tracking has been so exact that a two-week voyage can be timed for arrival with an accuracy of under fifteen minutes. It has resulted in such revolutions as on time guaranteed delivery and just in time manufacturing. Raw materials arrive from factories in sealed containers less than an hour before they are required in manufacture, resulting in reduced inventory expense. Exporters load merchandise in boxes that are provided by the shipping companies. They are then delivered to the docks by road, rail or a combination of both for loading onto container ships. Prior to containerization, huge gangs of men would spend hours fitting various items of cargo into different holds. Today, cranes, installed either on the pier or on the ship, are used to place containers on board the ship. When the hull has been fully loaded, additional containers are stacked on the deck. Today's largest container ships measure 400 metres (1,300 ft) in length. They carry loads equal to the cargo-carrying capacity of sixteen to seventeen pre-World War II freighter ships. There are several key points in the design of modern container ships. The hull, similar to bulk carriers and general cargo ships, is built around a strong keel. Into this frame is set one or more below-deck cargo holds, numerous tanks, and the engine room. The holds are topped by hatch covers, onto which more containers can be stacked. Many container ships have cargo cranes installed on them, and some have specialized systems for securing containers on board. The hull of a modern cargo ship is a complex arrangement of steel plates and strengthening beams. The hull is built around the keel. Resembling ribs, and fastened at right-angles to the keel are the ship's frames. The ship's main deck, the metal platework that covers the top of the hull framework, is supported by beams that are attached to the tops of the frames and run the full breadth of the ship. The beams not only support the deck, but along with the deck, frames, and transverse bulkheads, strengthen and reinforce the shell. Another feature of recent hulls is a set of double-bottom tanks, which provide a second watertight shell that runs most of the length of a ship. The double-bottoms generally hold liquids such as fuel oil, ballast water or fresh water. A ship's engine room houses its main engines and auxiliary machinery such as the fresh water and sewage systems, electrical generators, fire pumps, and air conditioners. In most new ships, the engine room is located in the aft portion. Container ships are distinguished into 7 major size categories: small feeder, feeder, feedermax, Panamax, Post-Panamax, New Panamax and ultra-large. As of December 2012, there were 161 container ships in the VLCS class (Very Large Container Ships, more than 10,000 TEU), and 51 ports in the world can accommodate them. The size of a Panamax vessel is limited by the original Panama canal's lock chambers, which can accommodate ships with a beam of up to 32.31 m, a length overall of up to 294.13 m, and a draft of up to 12.04 m. The Post-Panamax category has historically been used to describe ships with a moulded breadth over 32.31 m, however the Panama Canal expansion project has caused some changes in terminology. The New Panamax category is based on the maximum vessel-size that is able to transit a new third set of locks, which opened in June 2016. The third set of locks were built to accommodate a container ship with a length overall of 366 metres (1,201 ft), a maximum width of 49 metres (161 ft), and tropical fresh-water draft of 15.2 metres (50 ft). Such a vessel, called New Panamax class, is wide enough to carry 19 rows of containers, can have a total capacity of approximately 12,000 TEU and is comparable in size to a capesize bulk carrier or a Suezmax tanker. Container ships under 3,000 TEU are generally called feeders. Feeders are small ships that typically operate between smaller container ports. Some feeders collect their cargo from small ports, drop it off at large ports for transshipment on larger ships, and distribute containers from the large port to smaller regional ports. This size of vessel is the most likely to carry cargo cranes on board. A major characteristic of a container ship is whether it has cranes installed for handling its cargo. Those that have cargo cranes are called geared and those that don't are called ungeared or gearless. The earliest purpose-built container ships in the 1970s were all gearless. Since then, the percentage of geared newbuilds has fluctuated widely, but has been decreasing overall, with only 7.5% of the container ship capacity in 2009 being equipped with cranes. While geared container ships are more flexible in that they can visit ports that are not equipped with pierside container cranes, they suffer from several drawbacks. To begin with, geared ships will cost more to purchase than a gearless ship. Geared ships also incur greater recurring expenses, such as maintenance and fuel costs. The United Nations Council on Trade and Development characterizes geared ships as a "niche market only appropriate for those ports where low cargo volumes do not justify investment in port cranes or where the public sector does not have the financial resources for such investment". Instead of the rotary cranes, some geared ships have gantry cranes installed. These cranes, specialized for container work, are able to roll forward and aft on rails. In addition to the additional capital expense and maintenance costs, these cranes generally load and discharge containers much more slowly than their shoreside counterparts. The introduction and improvement of shoreside container cranes have been a key to the success of the container ship. The first crane that was specifically designed for container work was built in California's Port of Alameda in 1959. By the 1980s, shoreside gantry cranes were capable of moving containers on a 3-minute-cycle, or up to 400 tons per hour. In March 2010, at Port Klang in Malaysia, a new world record was set when 734 container moves were made in a single hour. The record was achieved using 9 cranes to simultaneously load and unload MV CSCL Pusan, a ship with a capacity of 9,600 TEU. Vessels in the 1,500–2,499 TEU range are the most likely size class to have cranes, with more than 60% of this category being geared ships. Slightly less than a third of the very smallest ships (from 100–499 TEU) are geared, and almost no ships with a capacity of over 4,000 TEU are geared. A view into the holds of a container ship. The vertical cell guides organize containers athwartships. Efficiency has always been key in the design of container ships. While containers may be carried on conventional break-bulk ships, cargo holds for dedicated container ships are specially constructed to speed loading and unloading, and to efficiently keep containers secure while at sea. A key aspect of container ship specialization is the design of the hatches, the openings from the main deck to the cargo holds. The hatch openings stretch the entire breadth of the cargo holds, and are surrounded by a raised steel structure known as the hatch coaming. On top of the hatch coamings are the hatch covers. Until the 1950s, hatches were typically secured with wooden boards and tarpaulins held down with battens. Today, some hatch covers can be solid metal plates that are lifted on and off the ship by cranes, while others are articulated mechanisms that are opened and closed using powerful hydraulic rams. Another key component of dedicated container-ship design is the use of cell guides. Cell guides are strong vertical structures constructed of metal installed into a ship's cargo holds. 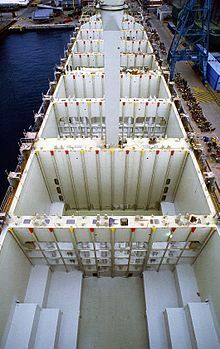 These structures guide containers into well-defined rows during the loading process and provide some support for containers against the ship's rolling at sea. So fundamental to container ship design are cell guides that organizations such as the United Nations Conference on Trade and Development use their presence to distinguish dedicated container ships from general break-bulk cargo ships. A system of three dimensions is used in cargo plans to describe the position of a container aboard the ship. The first coordinate is the BAY, which starts at the front of the ship and increases aft. The second coordinate is the ROW. Rows on the starboard side are given odd numbers and those on the port side are given even numbers. The rows nearest the centerline are given low numbers, and the numbers increase for slots further from the centerline. The third coordinate is"TIER", with the first tier at the bottom of the cargo holds, the second tier on top of that, and so forth. Container ships only take 20 foot, 40 foot, and 45 foot containers. 45 footers only fit above deck. 40 foot containers are the primary container size, making up about 90% of all container shipping and since container shipping moves 90% of the world's freight, over 80% of the world's freight moves via 40 foot containers. Twist-locks and lashing rods (pictured) are widely used to secure containers aboard ships. Numerous systems are used to secure containers aboard ships, depending on factors such as the type of ship, the type of container, and the location of the container. Stowage inside the holds of fully cellular (FC) ships is simplest, typically using simple metal forms called container guides, locating cones, and anti-rack spacers to lock the containers together. Above-decks, without the extra support of the cell guides, more complicated equipment is used. Three types of systems are currently in wide use: lashing systems, locking systems, and buttress systems. Lashing systems secure containers to the ship using devices made from wire rope, rigid rods, or chains and devices to tension the lashings, such as turnbuckles. The effectiveness of lashings is increased by securing containers to each other, either by simple metal forms (such as stacking cones) or more complicated devices such as twist-lock stackers. A typical twist-lock is inserted into the casting hole of one container and rotated to hold it in place, then another container is lowered on top of it. The two containers are locked together by twisting the device's handle. A typical twist-lock is constructed of forged steel and ductile iron and has a shear strength of 48 tonnes. The buttress system, used on some large container ships, uses a system of large towers attached to the ship at both ends of each cargo hold. As the ship is loaded, a rigid, removable stacking frame is added, structurally securing each tier of containers together. Containerships have typically had a single bridge and accommodation unit towards the rear, but to reconcile demand for larger container capacity with SOLAS visibility requirements, several new designs have been developed. As of 2015[update], some large containerships are being developed with the bridge further forward, separate from the exhaust stack. Some smaller containerships working in European ports and rivers have liftable wheelhouses, which can be lowered to pass under low bridges. As of 2010[update], container ships made up 13.3% of the world's fleet in terms of deadweight tonnage. The world's total of container ship deadweight tonnage has increased from 11 million DWT in 1980 to 169.0 million DWT in 2010. The combined deadweight tonnage of container ships and general cargo ships, which also often carry containers, represents 21.8% of the world's fleet. As of 2009[update], the average age of container ships worldwide was 10.6 years, making them the youngest general vessel type, followed by bulk carriers at 16.6 years, oil tankers at 17 years, general cargo ships at 24.6 years, and others at 25.3 years. Most of the world's carrying capacity in fully cellular container ships is in the liner service, where ships trade on scheduled routes. As of January 2010, the top 20 liner companies controlled 67.5% of the world's fully cellular container capacity, with 2,673 vessels of an average capacity of 3,774 TEU. The remaining 6,862 fully cellular ships have an average capacity of 709 TEU each. The vast majority of the capacity of fully cellular container ships used in the liner trade is owned by German shipowners, with approximately 75% owned by Hamburg brokers. It is a common practice for the large container lines to supplement their own ships with chartered-in ships, for example in 2009, 48.9% of the tonnage of the top 20 liner companies was chartered-in in this manner. International law requires that every merchant ship be registered in a country, called its flag state. A ship's flag state exercises regulatory control over the vessel and is required to inspect it regularly, certify the ship's equipment and crew, and issue safety and pollution prevention documents. As of 2006[update], the United States Bureau of Transportation Statistics count 2,837 container ships of 10,000 long tons deadweight (DWT) or greater worldwide. Panama was the world's largest flag state for container ships, with 541 of the vessels in its registry. Seven other flag states had more than 100 registered container ships: Liberia (415), Germany (248), Singapore (177), Cyprus (139), the Marshall Islands (118) and the United Kingdom (104). The Panamanian, Liberian, and Marshallese flags are open registries and considered by the International Transport Workers' Federation to be flags of convenience. By way of comparison, traditional maritime nations such as the United States and Japan only had 75 and 11 registered container ships, respectively. In recent years, oversupply of container ship capacity has caused prices for new and used ships to fall. From 2008 to 2009, new container ship prices dropped by 19–33%, while prices for 10-year-old container ships dropped by 47–69%. In March 2010, the average price for a geared 500-TEU container ship was $10 million, while gearless ships of 6,500 and 12,000 TEU averaged prices of $74 million and $105 million respectively. At the same time, secondhand prices for 10-year-old geared container ships of 500-, 2,500-, and 3,500-TEU capacity averaged prices of $4 million, $15 million, and $18 million respectively. In 2009, 11,669,000 gross tons of newly built container ships were delivered. Over 85% of this new capacity was built in the Republic of Korea, China, and Japan, with Korea accounting for over 57% of the world's total alone. New container ships accounted for 15% of the total new tonnage that year, behind bulk carriers at 28.9% and oil tankers at 22.6%. Most ships are removed from the fleet through a process known as scrapping. Scrapping is rare for ships under 18 years old and common for those over 40 years in age. Ship-owners and buyers negotiate scrap prices based on factors such as the ship's empty weight (called light ton displacement or LTD) and prices in the scrap metal market. Scrapping rates are volatile, the price per light ton displacement has swung from a high of $650 per LTD in mid-2008 to $200 per LTD in early 2009, before building to $400 per LTD in March 2010. As of 2009[update], over 96% of the world's scrapping activity takes place in China, India, Bangladesh, and Pakistan. The global economic downturn of 2008–2009 resulted in more ships than usual being sold for scrap. In 2009, 364,300 TEU worth of container ship capacity was scrapped, up from 99,900 TEU in 2008. Container ships accounted for 22.6% of the total gross tonnage of ships scrapped that year. Despite the surge, the capacity removed from the fleet only accounted for 3% of the world's containership capacity. The average age of container ships scrapped in 2009 was 27.0 years. Economies of scale have dictated an upward trend in sizes of container ships in order to reduce expense. However, there are certain limitations to the size of container ships. Primarily, these are the availability of sufficiently large main engines and the availability of a sufficient number of ports and terminals prepared and equipped to handle ultra-large container ships. Furthermore, the permissible maximum ship dimensions in some of the world's main waterways could present an upper limit in terms of vessel growth. This primarily concerns the Suez Canal and the Singapore Strait. In 2008 the South Korean shipbuilder STX announced plans to construct a container ship capable of carrying 22,000 TEU, and with a proposed length of 450 m (1,480 ft) and a beam of 60 m (200 ft). If constructed, the container ship would become the largest seagoing vessel in the world. Since even very large container ships are vessels with relatively low draft compared to large tankers and bulk carriers, there is still considerable room for vessel growth. Compared to today's largest container ships, Maersk Line's 15,200 TEU Emma Mærsk-type series, a 20,000 TEU container ship would only be moderately larger in terms of exterior dimensions. According to a 2011 estimate, an ultra-large container ship of 20,250 TEU would measure 440 m × 59 m (1,444 ft × 194 ft), compared to 397.71 m × 56.40 m (1,304.8 ft × 185.0 ft) for the Emma Mærsk class. It would have an estimated deadweight of circa 220,000 tons. While such a vessel might be near the upper limit for a Suez Canal passage, the so-called Malaccamax concept (for Straits of Malacca) does not apply for container ships, since the Malacca and Singapore Straits' draft limit of about 21 metres (69 ft) is still above that of any conceivable container ship design. In 2011, Maersk announced plans to build a new "Triple E" family of containerships with a capacity of 18,000 TEU, with an emphasis on lower fuel consumption. CSCL Globe is one of the largest container ships in the world. In the present market situation, main engines will not be as much of a limiting factor for vessel growth either. The steadily rising expense of fuel oil in the early 2010s had prompted most container lines to adapt a slower, more economical voyage speed of about 21 knots, compared to earlier top speeds of 25 or more knots. Subsequently, newly built container ships can be fitted with a smaller main engine. Engine types fitted to today's ships of 14,000 TEU are thus sufficiently large to propel future vessels of 20,000 TEU or more. Maersk Line, the world's largest container shipping line, nevertheless opted for twin engines (two smaller engines working two separate propellers), when ordering a series of ten 18,000 TEU vessels from Daewoo Shipbuilding in February 2011. The ships were delivered between 2013 and 2014. In 2016, some experts believed that the current largest container ships are at the optimum size, and could not economically be larger, as port facilities would be too expensive, port handling too time consuming, the number of suitable ports too low, and insurance cost too high. In March 2017 the first ship with an official capacity over 20,000 TEUs was christened at Samsung Heavy Industries. MOL Triumph has a capacity of 20,150 TEUs. Samsung Heavy Industries was expected to deliver several ships of over 20,000 TEUs in 2017, and has orders for at least ten vessels in that size range for OOCL and MOL. The top 100 ship size has grown more than three fold in past 18 years i.e. from ~4,500 TEU in 2000 to ~15,000 TEU in 2018.The biggest vessels are deployed on the Asia-Europe route whereas Intra-Asia route sees the smallest ships. By 2022, the largest container ships travelling along the Asia-Europe route will be around ~17,000 TEU compared to the 11,200 TEU now. Year-average daily charter rates for a 1-TEU (14-tonne) slot have varied from $2.70 to $35.40 between 2000 and 2010. The act of hiring a ship to carry cargo is called chartering. Outside special bulk cargo markets, ships are hired by three types of charter agreements: the voyage charter, the time charter, and the bareboat charter. In a voyage charter, the charterer rents the vessel from the loading port to the discharge port. In a time charter, the vessel is hired for a set period of time, to perform voyages as the charterer directs. In a bareboat charter, the charterer acts as the ship's operator and manager, taking on responsibilities such as providing the crew and maintaining the vessel. The completed chartering contract is known as a charter party. The United Nations Conference on Trade and Development, or UNCTAD, in its 2010 Review of Maritime Trade tracks two aspects of container shipping prices. The first is a chartering price, specifically the price to time-charter a 1 TEU slot for 14 tonne cargo on a container ship. The other is the freight rate, or comprehensive daily cost to deliver one-TEU worth of cargo on a given route. As a result of the late-2000s recession, both indicators showed sharp drops during 2008–2009, and have shown signs of stabilization since 2010. UNCTAD uses the Hamburg Shipbrokers’ Association (formally the Vereinigung Hamburger Schiffsmakler und Schiffsagenten e. V. or VHSS for short) as its main industry source for container ship freight prices. The VHSS maintains a few indices of container ship charter prices. The oldest, which dates back to 1998, is called the Hamburg Index. This index considers time-charters on fully cellular containerships controlled by Hamburg brokers. It is limited to charters of 3 months or more, and presented as the average daily cost in U.S. dollars for a one-TEU slot with a weight of 14 tonnes. The Hamburg Index data is divided into ten categories based primarily on vessel carrying capacity. Two additional categories exist for small vessels of under 500 TEU that carry their own cargo cranes. In 2007, VHSS started another index, the New ConTex which tracks similar data obtained from an international group of shipbrokers. The Hamburg Index shows some clear trends in recent chartering markets. First, rates were generally increasing from 2000 to 2005. From 2005 to 2008, rates slowly decreased, and in mid-2008 began a "dramatic decline" of approximately 75%, which lasted until rates stabilized in April 2009. Rates have ranged from $2.70 to $35.40 in this period, with prices generally lower on larger ships. The most resilient sized vessel in this time period were those from 200–300 TEU, a fact that the United Nations Council on Trade and Development attributes to lack of competition in this sector. Overall, in 2010, these rates rebounded somewhat, but remained at approximately half of their 2008 values. As of 2011, the index shows signs of recovery for container shipping, and combined with increases in global capacity, indicates a positive outlook for the sector in the near future. UNCTAD also tracks container freight rates. Freight rates are expressed as the total price in U.S. dollars for a shipper to transport one TEU worth of cargo along a given route. Data is given for the three main container liner routes: U.S.-Asia, U.S.-Europe, and Europe-Asia. Prices are typically different between the two legs of a voyage, for example the Asia-U.S. rates have been significantly higher than the return U.S.-Asia rates in recent years. Generally, from the fourth quarter of 2008 through the third quarter of 2009, both the volume of container cargo and freight rates have dropped sharply. 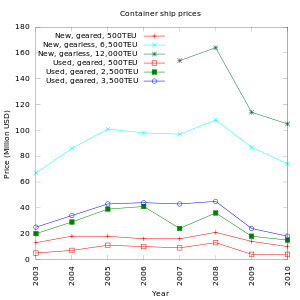 In 2009, the freight rates on the U.S.–Europe route were sturdiest, while the Asia-U.S. route fell the most. Liner companies responded to their overcapacity in several ways. For example, in early 2009, some container lines dropped their freight rates to zero on the Asia-Europe route, charging shippers only a surcharge to cover operating costs. They decreased their overcapacity by lowering the ships' speed (a strategy called "slow steaming") and by laying up ships. Slow steaming increased the length of the Europe-Asia routes to a record high of over 40 days. Another strategy used by some companies was to manipulate the market by publishing notices of rate increases in the press, and when "a notice had been issued by one carrier, other carriers followed suit". The Trans-Siberian Railroad (TSR) has recently become a more viable alternative to container ships on the Asia-Europe route. This railroad can typically deliver containers in 1/3 to 1/2 of the time of a sea voyage, and in late 2009 announced a 20% reduction in its container shipping rates. With its 2009 rate schedule, the TSR will transport a forty-foot container to Poland from Yokohama for $2,820, or from Pusan for $2,154. In an effort to control costs and maximize capacity utilization on ever larger ships, vessel sharing agreements, co-operative agreements and slot-exchanges and have become a growing feature of the maritime container shipping industry. As of March 2015, 16 of the world's largest container shipping lines had consolidated their routes and services accounting for 95 percent of container cargo volumes moving in the dominant east-west trade routes. Container traffic through a port is often tracked in terms of twenty foot equivalent units or TEU of throughput. As of 2009[update], the Port of Singapore was the world's busiest container port, with 25,866,000 TEU handled. That year, six of the busiest ten container ports were in the People's Republic of China, with Shanghai in 2nd place, Port of Hong Kong in 3rd, Shenzhen 4th, Guangzhou 6th, Ningbo 8th, and Qingdao 9th. Rounding out the top ten ports were Busan in South Korea at number 5, Dubai in the United Arab Emirates at number 7, and Rotterdam in the Netherlands in the 10th position with 9,743,290 TEU served. In total, the busiest twenty container ports handled 220,905,805 TEU in 2009, almost half of the world's total estimated container traffic that year of 465,597,537 TEU. It has been estimated that container ships lose between 2,000 and 10,000 containers at sea each year, costing $370 million. Most go overboard on the open sea during storms but there are some examples of whole ships being lost with their cargo. When containers are dropped, they immediately become an environmental threat – termed "marine debris". Once in the ocean, they fill with water and sink if the contents cannot hold air. Rough waters smash the container, sinking it quickly. The threat of piracy can cost a container shipping company as much as $100 million per year due to longer routes and higher speed, particularly near East Africa. ^ a b c UNCTAD, 2010, p. 33. ^ a b c McNicholas, p. 45. ^ Joint Chief of Staff (2005-08-31). "Bulk cargo" (PDF). Department of Defense Dictionary of Military and Associated Terms. Washington: Department of Defense. p. 73. Retrieved 2011-02-22. ^ From the American Heritage dictionary definition available on-line at Houghton Mifflin Company (2003). "Break bulk". The American Heritage Dictionary of the English Language, Fourth Edition. Huntingdon Valley, PA: Farlex Inc. Retrieved 2011-02-22. .
^ Meurn, 2004, pp. 1–7. ^ Bohlman, 2001, p. 13. ^ Bohlman, 2001, p. 15. ^ UNCTAD, 2010, p. 84. ^ Lewandowski, Krzysztof (2016). "The containers ships, which really was the first?". Transport Means 2016, Proceedings of the 20th International Scientific Conference, October 5–7, 2016, Juodkrante, Lithuania. : 668–676. ISSN 1822-296X. ^ Lewandowski, Krzysztof (2014). "Czechoslovak activity to prepare European norms for containers before the Second World War" (PDF). Acta Logistica. 1 (4): 1–7. doi:10.22306/al.v1i4.25. ISSN 1339-5629. ^ Levinson, 2006, p. 1. ^ Meurn, 2004, pp. 1–3. ^ Cudahy, 2004, p. 19. ^ Cudahy, 2004, p. 29. ^ "History - Port of New York and New Jersey - Port Authority of New York & New Jersey". ^ a b c d Hayler & Keever, 2004, p. 15-2. ^ a b c d Hayler & Keever, 2004, p. 15-3. ^ a b MAN Diesel, 2009, p.6. ^ Vesterager, Jacob. "Alphaliner: Verdens havne er ikke klar til gigantskibe" (World ports not ready for giant ships). ShippingWatch, December 2012. ^ a b UNCTAD, 2010, p. xiii. ^ a b Autoridad del Canal de Panamá, 2009. ^ a b Autoridad del Canal de Panamá, 2006, p. 45. ^ a b c d e f g h i j UNCTAD, 2010, p. 32. ^ "Mærsk Mc-Kinney Møller (13232687)". ABS Record. American Bureau of Shipping. Retrieved 1 May 2014.
van Ham, Hans; Rijsenbrij, Joan Rijsenbrij (2012). Development of containerization success through vision, drive and technology (Online-Ausg. ed.). Amsterdam: IOS Press. p. 290. ISBN 9781614991472. ^ Reederei Blue Star GmbH (2011). "Bay Class Overview". Reederei Blue Star Fleet. Hamburg: Reederei Blue Star GmbH. Archived from the original on July 19, 2011. Retrieved 2011-03-05. ^ Fearnresearch (2005). "Fearnley's Annual Review, 2004" (PDF). Oslo: Fearnleys AS. p. 90. Retrieved 2011-03-05. ^ a b c d e f Conrad, 1989, p. 249. ^ a b UNCTAD, 2010, p. 100. ^ a b c d e f Meurn & Sauerbier, 2004, pp. 1–16. ^ a b Hayler & Keever, 2004, pp. 5–10. ^ Hayler & Keever, 2004, pp. 5-9 – 5-10. ^ a b c d e f Meurn & Sauerbier, 2004, p. 1-19–1-21. ^ a b c d e Meurn and Sauerbier, 2006, p. 1-35. ^ Peck and Hale, 2000, p. 1-4. ^ Peck and Hale, 2000, p. 2. ^ a b Peck and Hale, 2000, p. 12. ^ Peck and Hale, 2000, p. 10. ^ a b Meurn and Sauerbier, 2006, p. 1-38–1-40. ^ "Alphaliner – TOP 100 – Existing fleet on January 2019". www.alphaliner.com. Retrieved 2019-01-05. ^ "PublicTop100". alphaliner.axsmarine.com. Retrieved 2019-01-05. ^ "World container-fleet capacity has grown by 50 percent since 2008". Progressive Economy. 12 December 2012. Retrieved 30 June 2015. ^ "Global containership fleet - TEUs 2017 | Statistic". Statista. Retrieved 2018-02-23. ^ UNCTAD 2010, p. 30. ^ UNCTAD 2010, p. 31. ^ UNCTAD 2010, p. 34. ^ a b c d e f g h i j k l m n o p q r s t u v w x UNCTAD, 2010, pp. 85. ^ a b c d Bureau of Transportation Statistics, 2007, p. 80. ^ UNCTAD 2010, p. 53, 57. ^ UNCTAD 2010, p. 56. ^ UNCTAD 2010, p. 57. ^ a b c UNCTAD 2010, p. 50. ^ Bailey, Paul J. (2000). "Is there a decent way to break up ships?". Sectoral Activities Programme. International Labour Organization. Retrieved 2007-05-29. ^ UNCTAD, 2010, p. 35. ^ Maritime Transport Coordination Platform (November 2006). "3: The London Tonnage Convention" (PDF). Tonnage Measurement Study. MTCP Work Package 2.1, Quality and Efficiency. Bremen/Brussels. p. 3.3. Archived from the original (PDF) on 2007-03-30. Retrieved 2007-05-29. ^ a b c d UNCTAD 2010, p. 51. ^ UNCTAD 2010, p. 53. ^ a b UNCTAD 2010, p. 52. ^ "New Largest Containership In The World 'OOCL Hong Kong' Christened haul". Retrieved 28 July 2017. ^ "China's largest cargo ship handed over to owners | Hellenic Shipping News Worldwide". www.hellenicshippingnews.com. Retrieved 2018-06-14. ^ "CMA CGM ANTOINE DE SAINT EXUPERY". www.cma-cgm.com. Retrieved 2018-02-02. ^ "MOL Truth, Japan's 1st 20,000 TEU Containership, Delivered - Largest Built in Japan, to be Launched on Asia-North Europe Trade -". Mitsui O.S.K. Lines. Retrieved 2018-01-06. ^ a b "World's Largest Container Ship Named". The Maritime Executive. Retrieved 2017-03-18. ^ "Barzan - Hapag-Lloyd". www.hapag-lloyd.com. Retrieved 2018-01-06. ^ "Our Fleet of Vessels | MSC". www.msc.com. Retrieved 2018-01-06. ^ a b "COSCO SHIPPIING Lines". lines.coscoshipping.com (in Chinese). Retrieved 2018-02-02. ^ "Meet MSC Oscar, the world's largest container ship at 19,224 TEU | MSC". Retrieved 2018-01-06. ^ "STX reveals design for world's largest container ship". SeaTrade Asia. May 2008. Archived from the original on 2008-12-24. Retrieved 2008-09-10. ^ "STX ponders 20,000 TEU boxship". Turkish Maritime. May 2008. Retrieved 2008-09-10. ^ "New designs on the world's biggest container ships". Shipping Times. Shipping Times UK. 2008-05-28. Retrieved 2008-09-10. ^ "Emma Maersk (06151181)". ABS Record. American Bureau of Shipping. Retrieved 2011-03-13. ^ "Alphaliner" (PDF). Archived from the original (PDF) on 2011-07-07. Retrieved 2018-12-28. ^ "Global Container Shipping Market 2017-2022". Mobility Foresights. Retrieved 2019-03-18. ^ Aragon & Messer, 2001, p. 233. ^ a b Huber 2001, p. 212. ^ Huber 2001, pp. 212–213. ^ Huber 2001, p. 213. ^ UNCTAD, 2010, pp. 85–89. ^ Huber 2001, p. 225. ^ UNCTAD, 2010, p. 88. ^ a b Munim, Ziaul Haque; Schramm, Hans-Joachim (2017). "Forecasting container shipping freight rates for the Far East – Northern Europe trade lane". Maritime Economics & Logistics. 19 (1): 106–125. doi:10.1057/s41278-016-0051-7. ^ "Table 3.1. Container freight markets and rates" (PDF). Review of Maritime Transport. United Nations conference on trade and development. 14 October 2015. p. 58. ^ a b c d UNCTAD, 2010, p. 89. ^ "Ready to go". Drewry Shipping Consultants Limited. 12 Mar 2017. ^ Leach, Peter (7 January 2015). "Shippers, regulators will be watching closely as alliances launch services". JOC.com. Retrieved 23 March 2015. ^ a b c d e UNCTAD, 2010, p.97. ^ Janice Podsada (19 June 2001). "Lost Sea Cargo: Beach Bounty or Junk?". National Geographic News. Retrieved 2008-04-08. ^ Hauke Kite‐Powell. Benefits to maritime commerce from ocean surface vector wind observations and forecasts NOAA, December 2008. Accessed: 26 February 2011. ^ "Freak waves spotted from space". BBC News. 22 July 2004. Retrieved 6 October 2009. ^ Sources of Marine Debris NOAA. Retrieved: 25 November 2010. Aragon, James R.; Messer, Tuuli Anna (2001). Master's handbook on ship's business. Cambridge, Md: Cornell Maritime Press. ISBN 978-0-87033-531-0. Conrad, Edward E. (1989). "12. Containership Operations". In Hayler, William (ed.). Merchant Marine Officers' Handbook: based on the original edition by Edward A. Turpin and William A. MacEwen (5th ed.). Cambridge, Md: Cornell Maritime Press. ISBN 978-0-87033-379-8. Cudahy, Brian J. (2006). Box boats: how container ships changed the world. New York: Fordham University Press. ISBN 978-0-8232-2568-2. Peck and Hale (2000). "Container Stowage and Securing Systems" (PDF). West Sayville, NY: Peck & Hale. Archived from the original (PDF) on 2011-07-15. Retrieved 2011-03-01. Sauerbier, Charles L.; Meurn, Robert J. (2004). Marine Cargo Operations: a guide to stowage. Cambridge, Md: Cornell Maritime Press. ISBN 978-0-87033-550-1. Autoridad del Canal de Panamá (2005). MR Notice to Shipping Number N-1-2005 (PDF). Notices to Shipping. Balboa-Ancon: Autoridad del Canal de Panamá. pp. 11–12. Retrieved 2008-04-01. Autoridad del Canal de Panamá (2006). Proposal for the Expansion of the Panama Canal: Third Set of Locks Project (PDF). Notices to Shipping. Balboa-Ancon: Autoridad del Canal de Panamá. Archived from the original (PDF) on 2011-07-21. Retrieved 2011-03-06. Autoridad del Canal de Panamá (2009). Dimensions for Future Lock Chambers and "New Panamax" Vessels (PDF). Notices to Shipping. Balboa-Ancon: Autoridad del Canal de Panamá. Retrieved 2011-03-06. MAN Diesel (2009). "Propulsion Trends in Container Vessels" (PDF). Copenhagen: MAN Diesel. Archived from the original (PDF) on 2012-05-07. Retrieved 2011-12-29. Bureau of Transportation Statistics 2007 (2008). Maritime Trade & Transportation (PDF). Washington, D.C.: United States Department of Transportation, Research and Innovative Technology Administration. Archived from the original (PDF) on 2009-05-10. Retrieved 2011-03-02. Central Intelligence Agency (2009). CIA World Factbook 2009. Skyhorse Publishing. ISBN 978-1-60239-080-5. Retrieved 2011-02-21. Economic and Social Commission for Asia and the Pacific (2009). Review of Developments in Transport in Asia and the Pacific 2007: Data and Trends (Economic and Social Commission for Asia and the Pacific). New York: United Nations. pp. 144–146. ISBN 978-92-1-120534-3. Retrieved 2011-03-05. United Nations Conference on Trade and Development (UNCTAD) (2012). Review of Maritime Transport, 2012 (PDF). New York and Geneva: United Nations. ISBN 978-92-1-112860-4. Bohlman, Michael T. (September 2001). "ISO's container standards are nothing but good news" (PDF). ISO Bulletin: 12–15. Archived from the original (PDF) on 2008-04-09. The New Scientist (22 May 1958). "News and Comments". New Scientist. 4 (79): 10. Archived from the original on 7 July 2014. .
Cudahy, Brian J. (September–October 2006). "The Containership Revolution: Malcom McLean's 1956 Innovation Goes Global" (PDF). TR News. 246: 5–9. Retrieved 2011-03-01. . Horizon Lines. "History of Sea-Land, CSX Lines, and Horizon Lines Timeline (1956–Present)". Horizon Lines web site. Archived from the original on 2010-12-27. Retrieved 2011-02-24. Jankowski, William M. (2003). Maritime Shipping Container Security and the Defense Transportation System: Problems and Policy in the 21st Century (M.S. thesis). Naval Postgraduate School. Retrieved 2011-02-23. Levinson, Marc (2006). The Box: How the Shipping Container Made the World Smaller and the World Economy Bigger. Princeton, N.J: Princeton University Press. ISBN 978-0-691-12324-0. Nichols, C. Reid; Williams, Robert G. (November 2008). Encyclopedia of Marine Science. Infobase Publishing. pp. 121–122. ISBN 978-0-8160-5022-2. Retrieved 8 March 2011. Roland, Alex; Bolster, W Jeffrey; Keyssar, Alexander (2008). The way of the ship: America's maritime history reenvisioned. Hobokken, New Jersey: John Wiley and Sons. ISBN 978-0-470-13600-3. "The container industry: The world in a box". The Economist. 2006-03-16. Retrieved 2011-02-22. Michael McNicholas (2008). Maritime security: an introduction. Boston, MA: Butterworth Heinemann. ISBN 978-0-12-370859-5. Retrieved 2011-03-05. Wikimedia Commons has media related to Container ships. RODRIGO DE LARRUCEA, Jaime. "Container Ship Safety" (PDF). Retrieved 19 April 2012.